Despite fleeting moments of entertainment, The Angry Birds Movie comes across as a hollow viewing experience that doesn't have much to offer. The Angry Birds Movie tells the story of Red (Jason Sudeikis), an outcast on the tropical paradise Bird Island due to his frequent anger issues. After an incident at a child's birthday party, Red is sentenced to anger management class where he meets other birds such as the hyped-up Chuck (Josh Gad) and "explosive" Bomb (Danny McBride). Red, perpetually grumpy, sees the treatment as a giant waste of time, and his poor attitude fails to impress his classmates and the instructor, Matilda (Maya Rudolph). Life on Bird Island is disrupted one day with the arrival of the pigs, led by Leonard (Bill Hader). Claiming that his species are great explorers, Leonard offers the birds tokens of friendship, and the pigs are immediately welcomed. Red, upset about the pigs' boat crashing into (and destroying) his beachfront house, is skeptical of the newcomers and investigates their ship. Discovering that there are more pigs onboard than Leonard had initially claimed, Red tries to warn his fellow birds about his suspicions, but becomes more of a misfit for not accepting the pigs. It isn't until the pigs abscond with unhatched bird eggs that the inhabitants of Bird Island learn the truth, and it's up to Red to lead a charge to get the eggs back. Based on the popular app game, The Angry Birds Movie is obviously attempting to replicate the success of 2014's The LEGO Movie, which took a well-known brand with no narrative through line and crafted a feature film around it. Unfortunately, it cannot duplicate that formula very well, and despite fleeting moments of entertainment, The Angry Birds Movie comes across as a hollow viewing experience that doesn't have much to offer - even for kids. Directors Clay Kaytis and Fergal Reilly earn points for the world-building on display. Bird Island (and Pig Island) are visually stunning environments that are ripe ground for the occasional strong gag or pop culture reference that the adults in attendance will appreciate (including an amusing nod to X-Men: Days of Future Past). The locales of Bird Island in particular have creative names that earn a chuckle, even if the puns become a little too obvious as the film moves along. Angry Birds also features a wide variety of colorful feathered characters, each with their own unique design and ability to make them stand out. When the action heats up in the third act (which incorporates aspects of the gameplay), those skills are all put to use and pay off in their own way. 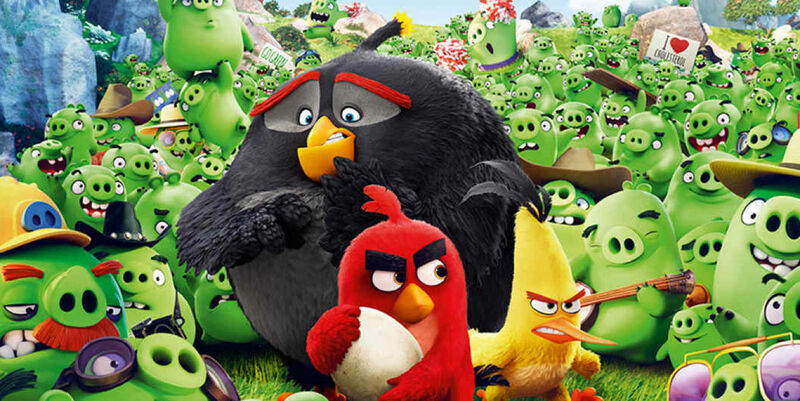 Where Angry Birds is lacking severely is the screenplay by Jon Vitti. Even for an animated film targeted at kids, the main cast of characters are extremely thin sketches without much depth. One personality trait is over-emphasized (i.e. Chuck always goes fast) at the expense of adding layers to the characters. In particular, Red is written as such a cantankerous protagonist in the beginning that at times it's difficult to root for him. The script attempts to flesh Red out with a backstory hinting at a troubled youth (orphaned and friendless), but that brief mention doesn't make up for the fact that he is generally mean-spirited towards everyone on Bird Island until the pigs steal the eggs. His arc comes across as unearned and doesn't resonate with the audience they way it should. Like other video game adaptations (see: Ratchet & Clank), Angry Birds is more concerned with selling its source material than telling a strong story. The bare-bones script possesses some noticeable gaps in logic, making character motivations unclear as things happen just out of necessity for the plot. Though the pigs are the clear villains of this tale (as they are in the game), they're introduced in such a friendly manner that their shift in allegiance is sudden and jarring. When they first show up, the pigs are responsible for some of the more amusing bits (a cowboy show and an EDM concert by "Daft Piggy") as they integrate themselves with the birds. The "conflict" between the two sides isn't set up sufficiently and seemingly comes out of nowhere, which could leave some viewers confused. Angry Birds also attempts to establish a friendship with the trio of Red, Chuck, and Bomb, but their dynamic lacks the heart of mismatched pairings in similar genre titles. As stated earlier, Red is such a grump early on, there's no real reason for his companions to be so willing to help him. If the characters were more well-rounded, their team-up could have been more rewarding, but the three are presented as extreme polar opposites (Chuck and Bomb are friendly and easy-going) that many will be left wondering why they join forces in the first place. Combining contrasting personalities is a formula that works well in the animation realm, but they all need to be sympathetic or relatable in order for it to have the necessary effect. Angry Birds fails in this regard, so it's hard to care about what's happening on-screen. In short, Angry Birds chooses to embrace commercialism over something more inventive and suffers as a result. The foundation was there for a memorable and worthwhile experience, but the filmmakers couldn't find a way to capitalize on its potential. The movie lacks a soul, and the better parts (such as Game of Thrones star Peter Dinklage hamming it up as Mighty Eagle) are few and far between. There isn't much for anyone to latch on to, meaning that viewers would be better served playing one of the many Angry Birds games on their smartphone as opposed to making the trip to see this in a theater. Viewers know that family films are capable of being emotionally engaging, wonderfully crafted works these days, and Angry Birds cannot clear that bar. The Angry Birds Movie runs 97 minutes and is rated PG for rude humor and action. It is now playing in U.S. theaters nationwide.